Ampthill survived a Chester fightback to secure a bonus point win on a damp and cold day at Dillingham Park. The pitch was in remarkably good condition given it had been covered by snow 24 hours earlier, but a howling gale blowing from the North was to prove influential. The first half saw the Amps backs break the line regularly, while the second – particularly the last quarter – saw Chester return the compliment. 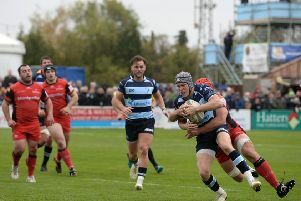 The visitors, with the benefit of the wind, began well with fly-half William Goodwin converting a third minute penalty after Amps were penalised in front of their posts. Full-back Brendan Burke responded with a similar penalty after six minutes to tie the scores. The hosts turned the screw for the next 15 minutes, and on 13 minutes Chester were again penalised and Burke took advantage with a penalty goal. The 17th minute saw the home side back in the visitors’ 22, with scrum-half Gavin Williams throwing a dummy and scampering over the line for an unconverted try. The pattern was broken in the 21st minute as Ampthill fly-half Joseph Tarrant received a yellow card for not releasing after he’d executed a try-saving last ditch tackle immediately in front of the posts. Goodwin was successful with the resulting penalty goal, leaving the score 11-6. However, Ampthill soon re-established control and while still a man down, secured a lineout inside Chester’s 22. A trademark catch and drive saw open side flanker Joseph Bercis come up with the ball for another unconverted try on 27 minutes. Two minutes later, Goodwin kicked his third successful penalty, followed by Amps securing another lineout. An identical catch and drive was held up over the visitors line, and the resulting 5m scrum would have seen a pushover try if the referee hadn’t raised his arm and run under the posts awarding a penalty try to the hosts, converted by Burke. The second half began as the first had finished, with the home side on the attack. However, despite the benefit of the gale and some fresh legs, Chester prevented Ampthill from scoring until the 58th minute when tight head prop Matthew Collins smashed over the line to the right of the posts. Not for the first time this season, it appeared to Amps supporters that the home players’ body language suggested they thought that the game was won. The visitors, of course, had other ideas and came right back into the game. First, on 69 minutes, Chester centre Rhys Hayes intercepted a telegraphed wide pass inside his own half and raced 50m to score under the posts, converted by Goodwin. Having been gifted seven points, the visitors now threw caution to the wind and scored a second try as loose head prop Gavin Woods crashed over the line in the 77th minute. Goodwin capped an excellent day with the boot as he converted to maintain a 100 per cent scoring record. But with the home spectators covering their eyes, the hosts managed to raise their game for the remainder of the match – keeping the visitors in their own half until time had elapsed. Ampthill head coach Paul Turner said: “After an outstanding first half in which both backs and forwards performed well, we led 23-9. Given the wind, that was a score that I might have taken had it been the other way round. “Having secured the bonus point, we then proceeded to attempt to throw the game away by doing precisely what the half-time team talk had said we should not do.